Today, in our new Color Crush series, we're highlighting one of my favorites- lilac! A fresh and modern color that is currently very popular both in fashion and home décor, lilac is perfect paired with shades of gray, cream, dark blues, or raspberry. Here is a smattering of gorgeous goods in this gotta-have-it shade. 1. This Moroccan Trellis Light Fixture combines form and function perfectly! 2. Graphic and bold, this Jonathan Adler mug is the perfect way to add some style to your morning coffee (or tea)! 3. Who's up for a DIY? This Flower Mobile can be customized to any colors of your choosing, but, personally, I think this purple and green combination is fresh and modern. 4. If you love throw pillows (who doesn't? ), Surya is your one-stop-shop for pillows in all shades of purple. From orchid to lilac, plum to royal purple, this is the place to shop! 5. Perfect for Spring, this clutch is an understated way to show your lilac love! 6. Combining many beautiful shades of purple, this scarf is lovely to look at and pairs perfectly with jeans and flats-perfect for a day around town! 7. 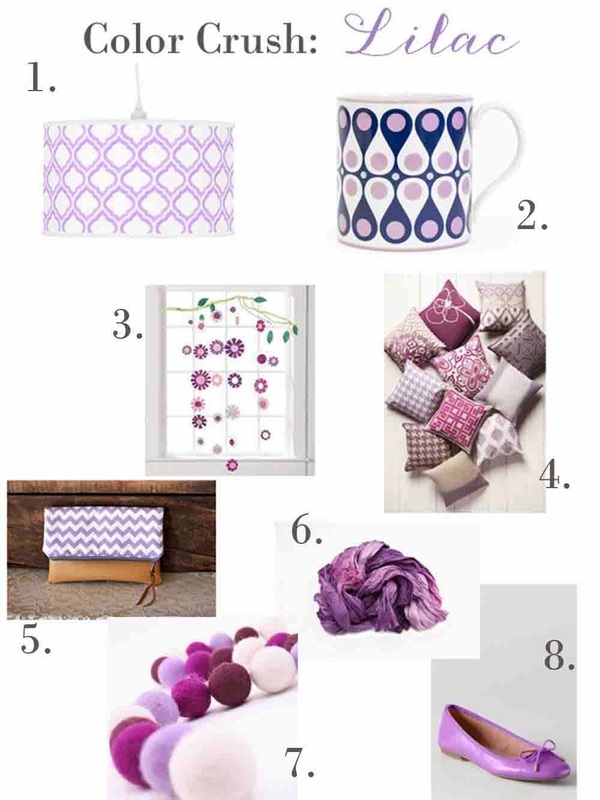 Looking to add some lilac décor to your home? These felt balls are a great starting point! Craft them into coasters, a garland, or wreath to add some pretty pizazz to your home. 8. Who doesn't love a great flat? Land's End has every hue imaginable...but I'm partial to this one in a pretty purple shade.